Extension to the Joint World Heritage Property "Primeval Beech forests of the Carpathians (Slovak Republic and Ukraine) and the Ancient Beech forests of Germany (Germany)"
Extension to the Joint World Heritage Property "Primeval Beech forests of the Carpathians (Slovak Republic and Ukraine) and the Ancient Beech forests of Germany (Germany)" is part of the Tentative list of Poland in order to qualify for inclusion in the World Heritage List. Map of Extension to the Joint World Heritage Property "Primeval Beech forests of the Carpathians (Slovak Republic and Ukraine) and the Ancient Beech forests of Germany (Germany)"
Bieszczady mountains NP in Poland is popular tourist destination, and no wonder why. The national park is simply beautiful and I take it as quintessential Carpatian mountains. Due to the depopulation after WWII, the area is not affected by utilitarian pressures as it can be found on Slovak side, which is already WHS. It certainly deserves WHS status. It is more touristy and maybe not so wild as forests on Slovakia part. 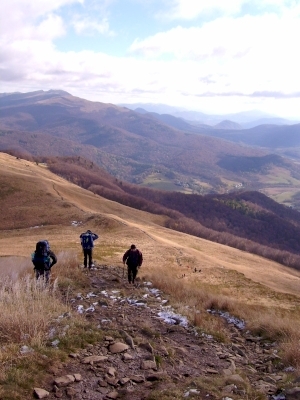 Due to a bit higher attitude there are large poloninas (mountain meadows) on the mountains ranges, which are very attractive and worth-visiting as well (although poloniny area itself is not part of proposed WHS). I also admired forest management that is 1000-times better than in official WHS of Slovakia. Only shadow on my optimism concerning Polish contribution to this WHS lays in unclear politics in Poland nowdays. Therefore, the nomination was withdrawn by state party in 2017 in spite of high qualities of Polish component, which would be perfetly complementar to sites in Slovakia and Ukraine. I am afraid that it is somehow related to issue in Bielowieza forest, and Polish side wants to avoid "problems" with UNESCO in case of controversial management in forests. Unesco Website: Extension to the Joint World Heritage Property "Primeval Beech forests of the Carpathians (Slovak Republic and Ukraine) and the Ancient Beech forests of Germany (Germany)"